Varner-Hogg Plantation State Historic Site, Brazoria County. Image available on the Internet and included in accordance with Title 17 U.S.C. Section 107. VARNER-HOGG PLANTATION STATE HISTORIC SITE. Varner-Hogg Plantation State Historic Site (formerly Varner-Hogg Plantation State Historical Park) is on Farm Road 2852 off State Highway 35, two miles north of West Columbia in Brazoria County. Varner Creek runs through the 65.66-acre park site, which features a refurbished two-story Greek Revival plantation house built around 1835. Donated to the state in 1958 by philanthropist Ima Hogg, the park is named for its first and last owners. 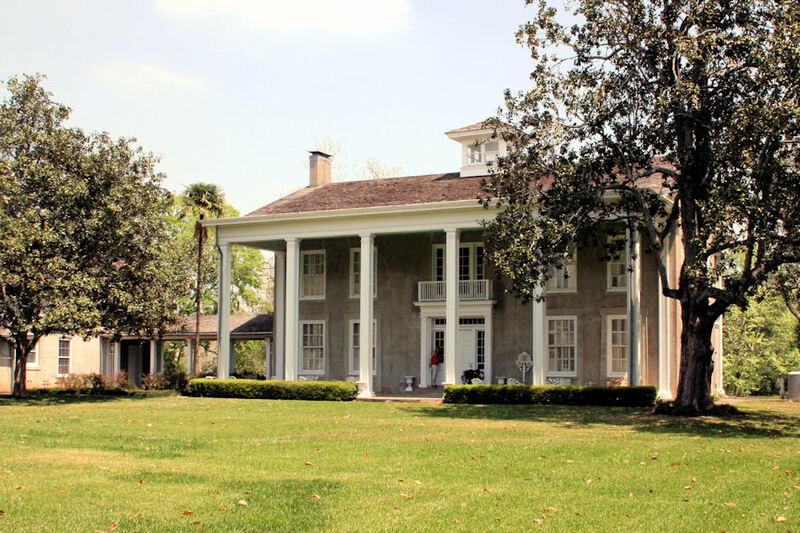 With its antebellum home and other historical buildings, it provides a view of plantation life in Texas between 1835 and 1850, the time of the plantation's greatest productivity. This period is also reflected in its furnishings. Varner-Hogg was named to the National Register of Historic Places on April 9, 1980. Effective January 1, 2008, operational control of Varner-Hogg Plantation State Historic Site was placed with the Texas Historical Commission. The property was originally owned by Martin Varner, a member of Stephen F. Austin's Old Three Hundred and a veteran of the Texas Revolution. Varner and his family moved there in 1824 and lived in a cabin he built on the creek bank. Varner farmed corn and raised livestock and probably some sugar cane. He was thanked in 1829 by Austin for a gift of rum, which Austin called the first "ardent spirits" made in the colony, and possibly in Texas. On April 4, 1834, Varner sold his holdings in Brazoria County for $13,000 to Columbus R. Patton who, as the family's eldest son, represented his father, John D. Patton, in the purchase. From this time through the remainder of the nineteenth century, the plantation was known simply as the Patton place. A large contingent of the Patton family settled in Brazoria County and developed the site into a successful sugar plantation. They built a barn, stables, a smokehouse, slave quarters, and a sugar house. Several of the Patton men were active in politics prior to the Texas Revolution, and three, Columbus, St. Clair, and William H. Patton, served in the army. The latter two were in the battle of San Jacinto. William, who was Sam Houston's aide-de-camp, was part of the group that guarded Antonio López de Santa Anna after his capture and escorted him to Orozimbo Plantation in Brazoria County. During this time Santa Anna was held briefly at the Patton place. Prior to the Civil War Columbus Patton had a racetrack on the plantation. Of the twenty-three sugar producers in Brazoria County, the Patton plantation was the fifth most productive in 1849, producing 275,000 pounds of sugar and 22,000 gallons of molasses. Columbus Patton continued to operate the plantation until November 1854, when he was declared insane by a Brazoria County court and placed in an asylum in South Carolina. John Adriance, a Brazoria County merchant and plantation owner, was named to administer the Patton estate. Columbus Patton's death on September 29, 1856, placed his estate in probate court again. His family attempted to overturn the will, and after partial settlement Adriance continued to manage the plantation through 1869, when the land, equipment, livestock, and improvements were sold. The property continued to produce sugar, operating in part through the convict lease system of the Texas prison system. The Galveston hurricane of 1900 blew down the sugar house and many other buildings at the plantation, but the house survived, and in 1901 the property was sold for $30,000 to former Governor Hogg. Although he had bought the place as an investment, Hogg began thinking of it as a second home for his children. He became convinced that great quantities of oil lay beneath its surface and stipulated in his will that the mineral rights could not be sold for fifteen years after his death. Before that time had expired, the West Columbia oilfield was brought in, and the family's proceeds from oil production on the plantation land became the foundation for its wealth. Some changes in the plantation house were made in 1920 by the Hogg family, but the interior of the main structure remained much as it was when it was purchased. The house's entrance was changed, a second-floor gallery on what is now the front of the home was removed, and six large pillars were installed from ground to roof. A breezeway was built to connect the parlor and the enlarged dining room, which adjoins the rebuilt kitchen. A stucco covering was added to protect the exterior bricks, which slaves made from clay from the bed of the nearby Brazos River and fired on the plantation. Other points of interest include the Patton family cemetery, foundation ruins of the sugar mill, and several slave cabins. Eugene C. Barker, ed., The Austin Papers (3 vols., Washington: GPO, 1924–28). Robert C. Cotner, James Stephen Hogg: A Biography (Austin: University of Texas Press, 1959). James A. Creighton, A Narrative History of Brazoria County (Angleton, Texas: Brazoria County Historical Commission, 1975). Louise Iscoe, "The House on Varner Creek," Texas Highways, January 1982. George P. Rawick, ed., The American Slave: A Composite Autobiography, Supplement, Series 2 (Westport, Connecticut: Greenwood Press, 1979). Abner J. Strobel, The Old Plantations and Their Owners of Brazoria County (Houston, 1926; rev. ed., Houston: Bowman and Ross, 1930; rpt., Austin: Shelby, 1980). Texas Parks and Wildlife Department, Tour Guide Through Varner-Hogg House Museum (Austin, 1984). Handbook of Texas Online, Marie Beth Jones, "VARNER-HOGG PLANTATION STATE HISTORIC SITE," accessed April 21, 2019, http://www.tshaonline.org/handbook/online/articles/ghv01. Uploaded on June 15, 2010. Modified on September 9, 2016. Published by the Texas State Historical Association.